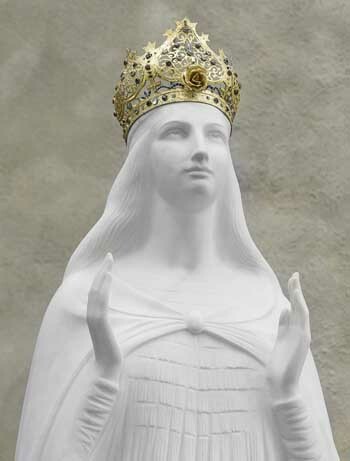 Continuing my series of articles on Our Lady of Knock (previous articles here, here, here and here), I remind the reader I am studying the Knock Apparition (1879) in light of Our Lady’s three other apparitions at La Salette (1846), Lourdes (1858) and Fatima (1917), with an emphasis on Lourdes. I want to show the inter-relationships among the apparitions in order to place the Knock apparition, which is often ignored, into the picture for our times. At La Salette Our Lady said: “Melanie, what I am going to tell you now will not always be secret. 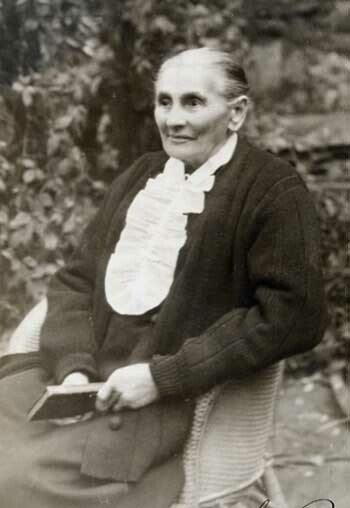 You will be allowed to publish it in 1858.” This was the year she appeared in Lourdes. At La Salette as well as at Lourdes, a miraculous spring flowed after Our Lady’s apparition, which caused many cures. The dogma of Papal Infallibility was also declared in 1870. But it is especially noteworthy that the year of the apparition at Knock (1879) marks the 25th anniversary of the infallible declaration of the dogma of the Immaculate Conception. Pope Pius IX was the reigning Pontiff during the La Salette and Lourdes apparitions, but he died the year before the silent Knock apparition. August 21, 1879, is not only the day of the apparition of Knock, the Consecration of the Basilica of La Salette and the papal coronation of Our Lady of La Salette, but it is also the year of the completion of the Cathedral of Lourdes begun under Pius IX in 1870 with his approval. St. Bernadette received secrets from Our Lady of Lourdes that she kept to her death on April 16, 1879. Four months later in 1879, we have the silent apparition of Knock. The 18th and last apparition of Our Lady in Lourdes was July 16, the feast of Our Lady of Mount Carmel. At the last apparition in Fatima on, October 13, 1917, Our Lady appeared as Our Lady of Mount Carmel. If we look at the four successive apparitions – La Salette (1846), Lourdes (1858), Knock (1879) and Fatima (1917) – it is interesting to notice the increasingly hostile weather conditions of each. At La Salette, the weather was beautiful, a glorious sunny day in the French Alps. But at Lourdes, things began to change. 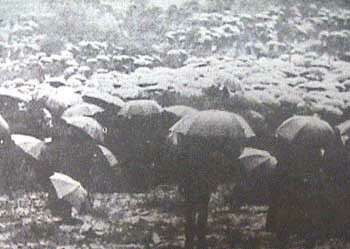 Despite this threatening beginning, the multiple apparitions of Lourdes were not particularly marked by rain or bad weather. At Knock, as I previously mentioned, the rain became a downpour. But in my readings I found no mention of any lightning or thunder. At Fatima, all the apparitions were presaged by a type of lightening flash and thunder. And by the last apparition on October 13, 1917 – the apparition for which Our Lady promised a sign – the weather for the week in that part of Europe had been the worst in recent memory. It was very cold and wet, and the roads became quagmires. Around noon, these meteorological omens culminated in a cosmic event now known as the “miracle of the sun”: The rain stopped, the clouds opened, colored rays dart from the sun, which ‘danced,’ then fell, causing great fear in the crowd. The spectators thought they were going to die. Then, the sun returned to its place in the heavens, and everything, including the muddy ground, became completely dry. Our Lady of Knock is an apparition replete with symbolism. Even though no words were spoken or written, through symbolism its message and meaning becomes clear. One important message – in the context of the other recent apparitions of Our Lady – is found in the increasingly threatening weather conditions that culminated in a cosmic event. I believe this is also a symbol that should be understood as part of a dire message that Our Lady wished to convey at Knock. A storm of cosmic proportions – a chastisement from God – is coming! If we consider the atrocities of the present Papacy, perhaps it has already begun. “I live in the village of Knock, to the east side of the chapel. Mary McLoughlin came on the evening of the 21st August to my house at about half past seven o’clock. She remained some little time. I came back with her as she was returning homewards. It was either eight o’clock or a quarter to eight at the time. It was still bright. I had never heard from Miss McLoughlin about the vision, which she had seen just before that. The first I learned of it was on coming at the time just named from my mother’s house in company with Miss Mary McLoughlin, and at the distance of 300 yards or so from the church. I beheld, all at once, standing out from the gable and rather to the west of it, three figures which, on more attentive inspection, appeared to be that of the Blessed Virgin, St. Joseph and St. John. That of the Blessed Virgin was life-size, the others apparently either not so big or not so high as her figure. They stood a little distance out from the gable wall, and, as well as I could judge, a foot and a half or two feet from the ground. The Virgin stood erect, with eyes raised to heaven; her hands elevated to the shoulders or a little higher, the palms inclined slightly towards the shoulders or bosom. She wore a large cloak of a white color, hanging in full folds and somewhat loosely around her shoulders, and fastened to the neck. 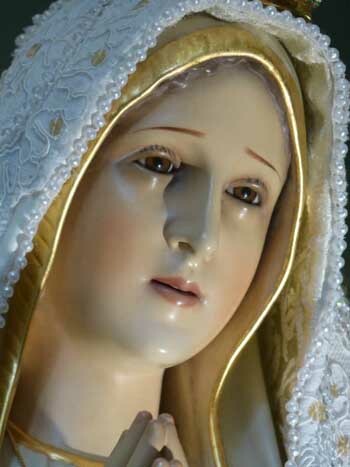 She wore a crown on the head, rather a large crown, and it appeared to me somewhat yellower than the dress or robes worn by Our Blessed Lady. In the figure of St. Joseph the head was slightly bent, and inclined towards the Blessed Virgin, as if paying her respect. It represented the saint as somewhat aged, with grey whiskers and greyish hair. He held the Book of Gospels, or the Mass Book, open in his left hand, while he stood slightly turned on the left side towards the altar that was over a little from him. I must remark that the statue which I had formerly seen at Lecanvey chapel had no miter on its head, while the figure which now beheld had one, not a high miter, but a short set kind of one. The statue at Lecanvey had a book in the left hand, and the fingers of the right hand raised. The figure before me on this present occasion of which I am speaking had a book in the left hand, as I have stated, and the index finger and the middle finger of the right hand raised, as if he were speaking, and impressing some point forcibly on an audience. It was this coincidence of figure and pose that made me surmise, for it is only an opinion, that the third figure was that of St. John, the beloved disciple of Our Lord, but I am not in any way sure what saint or character the figure represented. I said, as I now expressed, that it was St. John the Evangelist, and then all the others present said the same – said what I stated. The altar was under the window, which is in the gable and a little to the west near the center, or a little beyond it. Towards this altar St. John, as I shall call the figure, was looking, while he stood at the Gospel side of the said altar, which his right arm inclined at an angle outwardly, towards the Blessed Virgin. The altar appeared to be like the altars in use in the Catholic Church, large and full-sized. It had no linens, no candles, nor any special ornamentations; it was only a plain altar. Above the altar and resting on it was a lamb, standing with its face towards St. John, thus fronting the western sky. I saw no cross or crucifix.